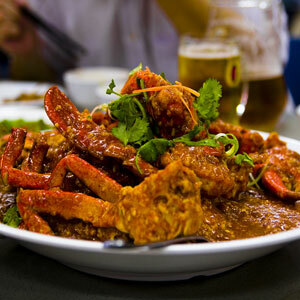 When it comes to food, the tiny island nation of Singapore punches way above its weight. The coming together of three world cuisines—Chinese, Indian, and Malay—with influences from three other Asian countries—Japan, Korea, and Indonesia—translates into a vibrant street food culture offering a dizzying variety of culinary delights. And strict hygiene standards ensure that hungry travelers aren’t laid low by a bug. Strolling by a row of hawker stalls in the legendary Newton Food Circus, I was accosted by a woman. Short, squat, exuberant, and clad in a flowery dress, this wild-haired grandmother with dancing eyes seemed to be asking for directions. She spoke in a tongue incomprehensible to me. She didn’t understand my English, either. Did I speak chili crab? I sure did. Even though a tourist myself, I knew where to find a vendor who specialized in Singapore’s national dish. 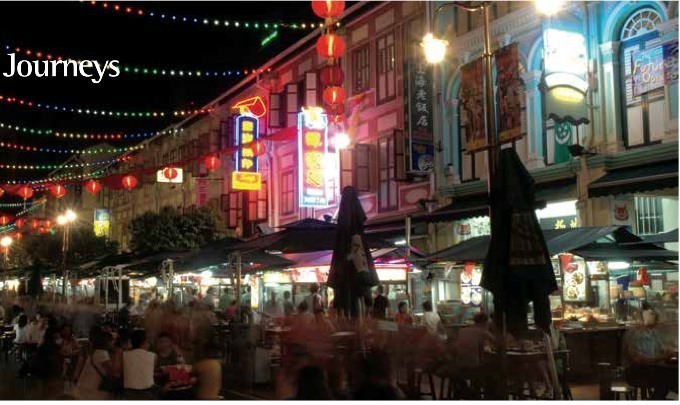 After all, I’d been visiting Singapore and these hawker stalls for years. “Follow me.” I steered her to the proper stall, whereupon she thanked me profusely, again in an incomprehensible tongue. Later, the same evening, I stood in line at the same stall and started a conversation with some fellow diners. The man ahead of me claimed that chili crab had always been a national obsession, while the woman behind me argued that the effusive praise from the tourists had made it world-renowned. My order came. The large platter before me contained a whole crab smothered in rich, velvety brown gravy. Being primarily a vegetarian, I went straight for the spicy, fragrant gravy prepared with just the right touches of chili, garlic, soybean paste, tomato puree, and lime juice. Singapore, with its well-deserved reputation for being obsessed with food, is located at the southern tip of the Malay Peninsula, 85 miles north of the equator. Once a sleepy 19th century fishing village, it is now a vibrant modern city-state, home to four million people, who speak one or more of the four official languages: Mandarin, Malay, Tamil, and English. The per capita income has risen to be one of the highest in Asia. My first trip to Singapore was more than two decades ago. After checking in at my hotel, I engaged a hotel clerk named Phoebe, a vivacious young woman in a blue suit, in a discussion about local food. “To a hawker center, where else?” Although the city-state boasted many restaurants, Phoebe went on to say, the partially open-air food centers as well as food courts situated inside modern buildings offer the best opportunity to try out various ethnic dishes. 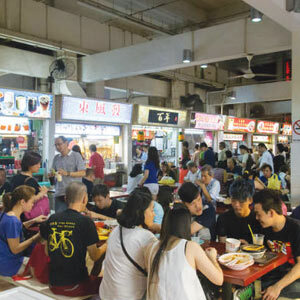 Every Singaporean, from street sweepers to corporate CEOs, is said to have a favorite hawker center and will travel any distance to dine there, singly, as couples, or most commonly in small social groups. These places offer a dizzying array of eclectic dishes; variety, quality, and purity are the order of the day. “Can I eat safely there?” I asked Phoebe. Taking her advice, I shunned regular restaurants and headed for a hawker center: Albert Center, where a cluster of food vendors operating small stalls under one roof offered the complete spectrum of Singaporean ethnic cuisines. The dishes, moderately priced, were usually made to order. The décor wasn’t much to speak of—bare concrete floors, Formica-topped tables, stainless steel cutlery, and no music except that of songbirds outside—but I could tell that this place buzzed from morning till midnight. It pleased me that shorts and T shirts, as well as dresses, were acceptable attire for women and that locals and tourists mingled here. I nodded and drew near. This affable woman, her hair pulled back, and with a lined face radiating the pride of a good cook, simplified my search. Acting less like a saleswoman and more like an aunt all too pleased to welcome a relative, she quickly went behind the stall and dragged out a water hose for me to rinse my hands, spilling a little water on herself, which she didn’t seem to mind. She deftly chopped and stir-fried a bundle of fresh hardy greens that I had been eyeing, even though such a dish didn’t exist on the menu. It thrilled me to find a human touch in a high-tech metropolis. As the cooking progressed, she ladled sauce from a nondescript plastic bucket and drizzled it over the ingredients. She served me the finished result on a white platter—subdued greens accompanied by a steaming scoop of glistening white rice. “Is your sauce a secret formula?” I asked, hoping that such wouldn’t be the case. “Yes, of course.” She smiled, adding that she’d learned the trade from her parents and jealously guarded all their seasoning secrets. Not only did she adhere to strict health codes laid down by the government, but she also offered low prices, a high standard of service, and honesty in the bargain, as her parents had instilled in her. Soon enough I started visiting other food centers. Doing so, I discarded any pretense that I knew Chinese food. Here the varieties extended well beyond the familiar Cantonese, Mandarin, Hunan, and Sichuan as found in the States, to include specialties from other provinces or ethnic groups of China. I learned that Hokkien dishes were simmered with generous amounts of garlic, ginger, and seaweed. 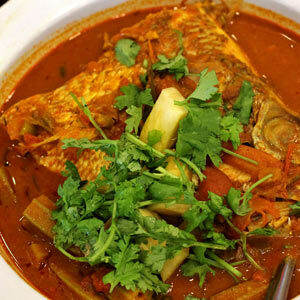 In the Teochew style of cooking, where the flavors tended to be delicate, steaming is the preferred method. Then there was Hakka, or “guest family,” the name given to a group forced to migrate centuries ago from northern China to the hills around Canton in the southern part of the country. The simple but flavorful Hakka cooking delightfully combines influences from the North and South. At a hawker stall, I also discovered Nyonya or “Wife Cooking,” the result of intermarriages between early Chinese settlers and the local Malay women. The cashier behind the counter informed me that Nyonya was the only cuisine Singapore could really call its own. I ordered laksa lemak, a tantalizing coconut-milk based noodle soup. It was spiced by laksa paste: a riot of garlic, chili, lime, dried shrimp, lemongrass, and fish sauce, one that varied from cook to cook. The cashier further emphasized the importance of this spice paste by recalling a fact: in the past, a prospective bride had to prove her cooking ability to her Nyonya mother-in-law by successfully preparing the laksa paste in her presence. Good food appears to empower one’s tongue. 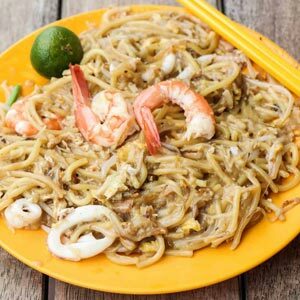 Soon I was confidently singing out an order for Hokkien mee, the famous stir-fried noodle dish that was just about guaranteed to cure any travel-related malady. 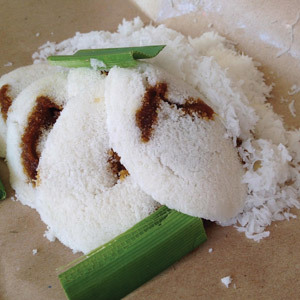 Another time, I ordered a kueh pie tee. I was served tiny pleated pastry cups packed with a spicy sweet vegetable mixture that were perfectly suited to my vegetarian taste. Alas, I didn’t always pick a winner. Carrot cake, popular as it might be, turned out to be a salty concoction made with preserved radish that didn’t hit my sweet spot. “How do you make even the simplest Singapore food taste so good?” I asked a chef. “It has to do with our unique seasonings,” the chef explained. “Chili and garlic start the list, followed by lemon grass, pandan leaves, tamarind, and fenugreek. Although I’m Chinese, I experiment with Indian spices. Turmeric is always by my side when I cook.” Singapore, after all, he reminded me, was located at the crossroads of the legendary spice route of Asia. Browsing at an English language bookstore, I came across a well-worn copy of Secret Food Map of Singapore. I found the concept of mapping a place by its food intriguing. But just why was this map a secret? I wondered. I purchased the map, although I’d soon find that it didn’t cover it all. At one hawker stall, my order of a deliciously chilled mixed-fruit dessert contained tiny, translucent seeds that exploded on my palate into a juicy coyness. I asked the vendor what those tasty rounds were. In her limited English she conveyed that they were jokingly called “frog’s eggs.” I maintained a smile on my face and went on eating, telling myself that on occasion a little mystery on the plate was not altogether a bad thing. 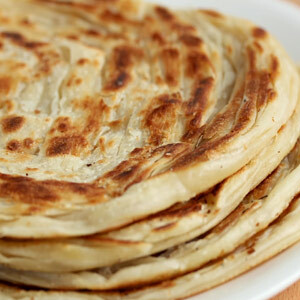 (Left) Singapore's famous prata roti. Since that first memorable sojourn, I’ve visited the island more than a dozen times, each time finding out a bit more about its food offerings. It is like flaking apart a multi-layered prata, the flat bread Singapore is so famous for. I usually park myself at a modest hotel located not far from the famous Raffles City (which is currently under renovation). Named after Sir Thomas Stamford Raffles, who established Singapore as a trading station, Raffles City is the center of the universe here for all practical purposes. Besides being a mall of tasteful, high-end shops and chic restaurants, it houses the transfer station for several routes of the efficient Mass Rapid Transit system. After a few hours of sight-seeing, I usually stop at one of the newer, air-conditioned hawker complexes. There I might watch a cook prepare a frothy glass of teh tarik, literally “tea tossed in the air,” or marvel at how quickly heaps of ikan bilis disappear from a vendor’s glass case. Condiments are very much a part of any meal here and ikan bilis can qualify both as a condiment served with rice, or alone as an appetizer. In this dish, tiny crispy roasted fishes mingle with peanuts in a tasty coating of garlic, tamarind, shallot, and dried chilies. “What an interesting combination,” I say to a vendor. “We thank our ancestors,” replies the vendor, “who brought it from Malaysia.” He further adds that even the younger generation of Singaporeans haven’t discarded the custom of snacking on this protein-rich side dish. Once I saw a man, with a far-away look in his eyes, perched at a street-side café table. He was holding a book and nursing a beverage, a half-eaten plate of ikan bilis before him. A taxi roared by, but the noise didn’t seem to register in his ears. Was he contemplating the plot from a W. Somerset Maugham novel, musing over a poem of his own, or recalling a pleasant encounter with a friend? I’d never know the answer, of course. But serenely seated here at the heart of a high-tech hub, he seemed to have taken the opportunity to grab a few fleeting minutes of quietness and relish the little pleasures of life. He reminded me why I return time and again to Singapore. Bharti Kirchner is the author of seven novels and four cookbooks and hundreds of articles. Her latest novel is called Season of Sacrifice: A Maya Mallick Mystery.